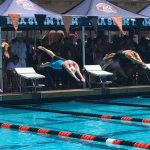 Girls Varsity Swimming · May 9 Sarah Isip Moves On to the CIF Finals! 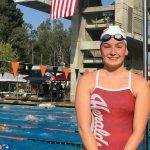 On Wednesday, May 9, Herald outstanding sophomore swimmer Sarah Isip competed in the CIF Prelims at the Riverside Community College Aquatics Center. Herald standout freshman Jake Yunker was also there as an alternate, but was not able to compete because the field was full. In the grueling 500 Freestyle, Sarah was seeded 6th with a time of 5:33.14. 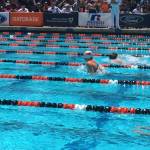 She went on to swim a personal best and finished 5th with a time of 5:26.48! Cutting off over 6 seconds is quite an accomplishment! In the much quicker 100 Breaststroke, Sarah went into the prelims seeded 6th with a time of 1:13.78. She shattered her personal best with a time of 1:09.84 and moved all the way up to 3rd place! 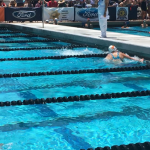 Sarah now goes on to the CIF FINALS this Friday, May 11th to swim in BOTH EVENTS! The Division 4 races start at 5:00 pm. 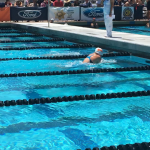 If you can, come out to the Riverside Community College Aquatics Center and cheer Sarah on. We are proud of you Sarah…GO HERALD!